Tai-chi relaxes and regulates the central nervous system, promotes physical and mental well-being and releases emotional and physical stress accumated through work or other anxieties. People of all ages can cultivate relaxation, balance, central equilibrium and physical co-ordination through these gentle and non-jarring exercises. Tai-chi is also often referred to as 'a moving meditation' or 'moving in stillness' or promoting self awareness and self discipline which in turn generates a feeling of well-being, where inner tensions dissolve and the 'mind' starts to quiten. A focus on awareness, breathing and visualisation techniques help to promote a deeper sense of relaxation and focus. 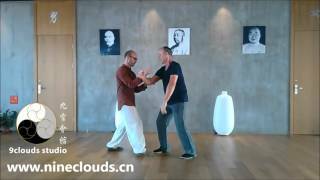 These sessions teach the loosening exercises of Master Huang and the first section of the Yang Style Tai Chi short form.